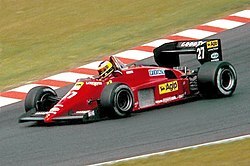 Lancia changed classes and cars once again in 1983 World Sportscar Championship season, but Alboreto remained as one of the team's primary drivers. He brought the new Lancia LC2 to a ninth-place finish in its debut at the 1000��km of Monza, but the new car struggled to finish the next few races of the season. His entries would not finish another race until round five, where he earned eleventh. While Lancia chose to skip later rounds of the championship, he would not return to the team in order to concentrate fully on his commitments to Formula One. His troubles with the LC2 and early departure from the team earned him only two points in the championship.